A few weeks ago, I went to a track day put on by put on by Motorsport Events Limited. Rather than use the big race circuits, these guys primarily use airfields. This particular one was at RAF Upper Heyford near Bicester. 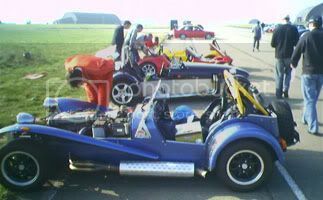 It was called the Heyford Academy Day since it was structured as a series of exercises that concentrated on car control and balance rather than just buzzing around a circuit. There was a good cross-section of cars. 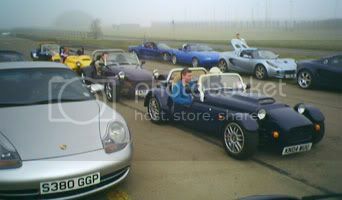 Lots of Caterhams and Elises but also Porsches, TVR's, Impreza's, BMW M3's and others. I have a neighbour down the road who also drives a 993 so he came along with me to the event. At the event, I ran into a fellow I had first met at a drifting day - Nigel in a fabulous old M3. Nice to have company but petrolheads are a friendly bunch anyway. 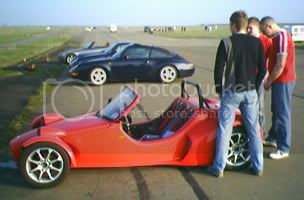 These particular events are especially good for Caterhams. They're fabulous at tight cornering. The Mojo (above) looked like a nice little kit and moved really well. You can read about it at MyMojo including a write-up of this event. The kit is from Sylva. My favourite exercise was simply a high speed left and right-hand corner where the goal was to see just how fast you could take it. I span out a couple of times trying to find that sweet spot where there car is drifting but you're still in control. A progressive slalom exercise was also really good for getting to know how the car reacts. The bottom line is that you really need to do a lot of this kind of practising to develop any consistent skill. Unfortunately, the day was very hard on the tyres. I had to later buy a new set for the rear. My clutch was also on its last legs at the event; it would slip quite a bit on hard accelleration. The good news is I now have a brand new clutch and a set of Michelin Pilot Sports (no more Pirelli's). Ready for another track day! 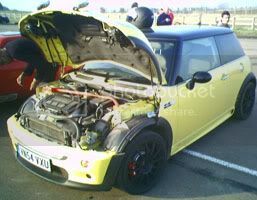 is there ne more days at upper heyford as i live in middleton stoney just 5min away and need practise in a car? wot dus it cost? Just click on the Calendar.